Visiting Greece is practically a rite of passage for travellers in Europe. From the mainland to the idyllic Greek Isles, there’s so much natural beauty and ancient architecture to admire. If you would really like to experience this country in all of its majesty, consider booking one of our walking holidays in Greece. There is no better way to explore Greece than on foot. Civilisations have sprouted, flourished and fallen here over thousands of years, leaving behind a rich legacy of ancient sites and diverse culture. By taking part in one of Hooked on Walking’s self-guided walking holidays in Greece, you’ll be retracing the footsteps of great conquerors, philosophers and artists of old. You’ll also have the opportunity to explore some of the wonderful Islands of Greece. Along the way, you’ll take in historic temples, beautiful panoramic landscapes, famous gorges, and the unmistakable azure waters of the Aegean Sea. The memories you create during a walking holiday in Greece will stay with you for a lifetime. 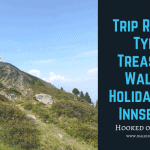 Hooked on Walking has been organising rewarding walking holidays for nearly 20 years. We’ve had the pleasure of helping many clients organise once-in-a-lifetime adventures on two legs. Over the years, our clients have consistently sung the praises of this majestic country and the people who call it home. Again and again, our guests praise the friendliness and helpfulness of Greek people. The food in Greece is simply divine, and there is no shortage of places to eat. Enjoying a glass or two of retsina or ouzo with friendly locals is an experience that you don’t want to miss. The Greek islands are all about good food, drink and hospitality against a stunning backdrop of natural beauty. With our experts planning your route and itinerary, you’ll get to experience and enjoy all of this at once. If you are interested in arranging a walking holiday in Greece, have a look at our list of offerings below. We offer self-guided tours of varying lengths and we can customise your experience so that it caters more to your interests. For example, we could adjust the itinerary so that it includes more time staying in a specific village or exploring an ancient temple that interests you. You could travel to Crete and explore remote locations such as Samaria Gorge and Irini Gorge. Every walk that we offer has been carefully created to ensure that it gives our guests the most rewarding experiences available. And while you’re trekking in Greece, we’ll see to it that your luggage is safely transported from one location to the next so that you can focus on walking. Other popular packages include trekking tours of the Cyclades or of Corfu and Paxos. We have extensive experience creating bespoke walking tours all over Europe, and we’ve become experts at personalising individual itineraries. We can arrange single walking holidays in Greece as well as treks for couples or even weekend walks for large groups. See below to learn more about the walking tours that we offer in Greece, and please don’t hesitate to get in touch with us for more. Enjoy highlights of the Corfu Trail before heading to Paxos. You shall explore on foot not only Athens but 2 contrasting Islands within the Saronic Gulf the sea to the south of Athens and the Peloponnese.